No unusual levels of noise, dust or vibration are expected. Residents may hear some construction noise, but it will not exceed levels permitted by state and federal regulations. Up to three lanes between SR-170 and SR-118: 9 p.m. to 5 a.m.
Tuxford Street: 8 p.m. to 6 a.m.
Lankershim Boulevard: 8 p.m. to 6 a.m.
Sheldon Street/Laurel Canyon Boulevard: 8 p.m. to 6 a.m.
Osborne Street: 8 p.m. to 6 a.m.
Paxton Street: 8 p.m. to 6 a.m.
Northbound I-5 to eastbound SR-118: 9 p.m. to 5 a.m.
Northbound I-5 to westbound SR-118: 11 p.m. to 5 a.m.
Southbound I-5 will be closed between Osborne Street and Sheldon Street the nights of Sept. 17 – 19, 11:59 p.m. to 4 a.m. See the attached notice for details. Additional closures below. 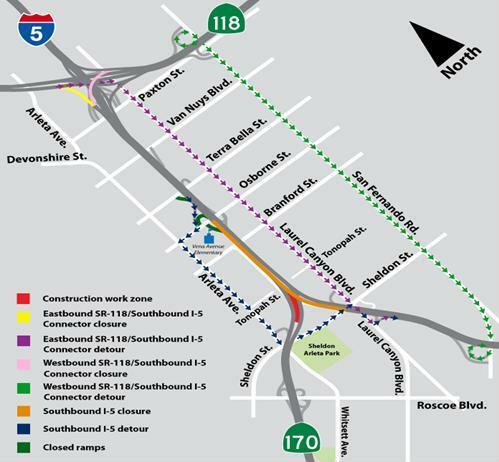 Eastbound/westbound Roscoe Boulevard: 8 p.m. to 6 a.m.
Two lanes of the northbound SR-170 connector to northbound I-5: 11 p.m. to 5 a.m.
Up to two lanes between I-5 and Roscoe Boulevard: 9 p.m. to 5 a.m.
Sheldon Street/Arleta Street — 9 a.m. to 3 p.m.
direct HOV connector at the I-5/SR-170 interchange. A direct HOV connector allows for freeway-to-freeway transfers without exiting the carpool lane.